On May 12, 1781, one woman was permitted to visit her prisoner husband in the mine shaft of New-gate Prison. Upon entering, the door was unlatched and roughly twenty men rushed through in an attempt to escape their living “hell.” Killing six guards on their way, Ebenezer Hathaway and Thomas Smith led the group of prisoners to freedom. As Loyalists, these men were considered enemies of the state. Their escape on May 12 was the largest in New-gate’s history and although the details are intriguing and exhilarating the escape did not happen as a solitary event. 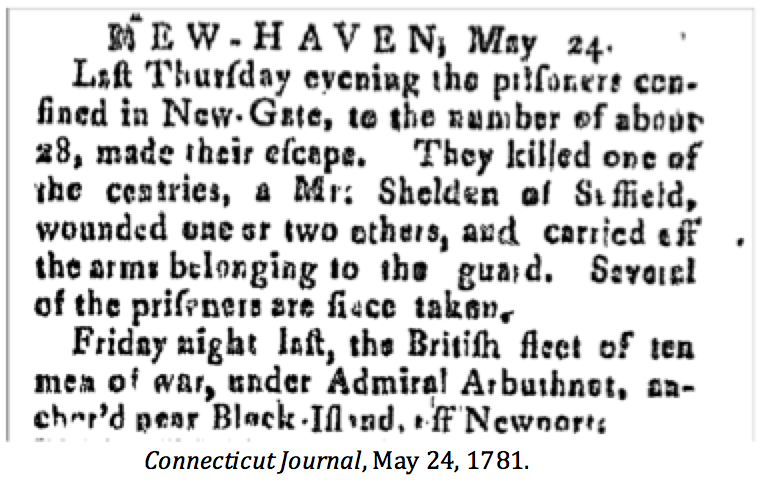 Understanding the laws and events that took place months before the escape is crucial to the history of Loyalists in Connecticut and specifically New-gate Prison during the American Revolution. The laws instituted against Loyalists were put in place to assert Patriot dominance in America. The Loyalist’s actions against the United States were their assertion that the rebels did not govern them. When the United Colonies declared war on the King of Great Britain they passed laws to punish anyone who treasonously aided the enemy. Individuals loyal to the King were persecuted, imprisoned, and sentenced to death for their beliefs and actions. New-gate Prison, in Simsbury, Connecticut, was the most notorious prison used to contain Tories. Prisoners were confined in an abandoned copper mine, 40 yards below the surface. Referred to as the “catacomb of loyalism,” New-gate was a dark, damp hole. The repression of Loyalists was not constricted to poor treatment at New-gate. Prisoners were put in New-gate because of laws instituted to punish anyone opposed to the United States America. In February 1781, the Governor of Connecticut and council of representatives issued, “An Act For Punishment Of High Treason And Other Atrocious Crimes Against The State.” In the midst of the war, this act sought to enhance punishment for those loyal to Great Britain. The law outlined that citizens or subjects of the United States who declared allegiance to the King of Great Britain, persuaded inhabitants to renounce their allegiance to the State, or aided the enemy would be guilty of high treason and sentenced to death or imprisoned at New-gate. In addition, those persons who joined the enemy, robbed, or plundered would not be considered prisoners of war, but convicted before the superior court and either sentenced to death, whipped, or imprisoned at New-gate. Loyalists were not considered prisoners of war, in order to prevent them from being exchanged and released. In 1781, the Patriots were cracking down on the Loyalists amongst them. Two months later, Ebenezer Hathaway and Thomas Smith were imprisoned at New-gate Prison, for “joining the enemy,” just as the law had demanded. Hathaway and Smith were captured in Huntington Bay off Long Island on April 7th, 1781, while aboard their “Privateer Boat Adventure.” After their capture the men were tried before the Superior Court, where they were urged to plead guilty. Hathaway and Smith, however, claimed they were British subjects and refused to plead guilty or not guilty, because they rejected the United States legislative system. In an attempt to get them to plead guilty, their sentence at New-gate was “sentenced until pleads indictment.” They were imprisoned at New-gate, without bail until they recognized the Superior Court as law and pled guilty or non-guilty. The policy on Loyalists in America was another issue of independence for the Patriots. The Act for Punishment of High Crimes in 1781 was an attempt for Patriots to control Loyalists in America and judge them with their laws. Hathaway and Smith did not recognize the United States’ laws and therefore refused to identify as guilty or not guilty. In only three weeks, Hathaway and Smith made their escape with twenty other Loyalist prisoners. The other men who participated in the escape were imprisoned for illicit trade, being a Tory, joining the enemy, or attempt to join the enemy; all crimes recognized in the February 1781 Act for Punishment of High Crimes. Their escape was the largest in New-gate history, and their joint effort to escape, demonstrated their resolve to join together in a common cause. Hathaway and Smith did not recognize the United States law, so escaping from New-gate Prison was not only about escaping the poor conditions of the prison. It was about fighting against their repression and unjust imprisonment. Calhoon, Robert McCluer. The Loyalist in Revolutionary America 1760-1781. New York: Harcourt Brace Jovanovich, Inc., 1965. Crary, Catherine S. The Price of Loyalty: Tory Writings from the Revolutionary Era. New York: McGraw-Hill Book Company, 1973. Phelps, Richard H. Newgate of Connecticut: A History of the Prison, its Insurrections, Massacres, & C. Imprisonment of the Tories, In the Revolution. Hartford: Elihu Geer, 1844. State of Connecticut. Primary Sources Archives, Hartford, CT.
Taylor, Alan. American Revolutions: A Continental History 1750-1804. New York: W.W. Norton & Company, 2016.